Did a little reading between sporting events this weekend…The three books I read range from easy to medium to pretty difficult. 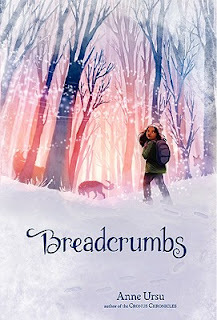 BREADCRUMBS, by Anne Ursu, is the third book I read this weekend. I feel like I need to preface this review with a warning. I am not an allegory reader. I'm one of the few teachers I know who doesn't especially like MANIAC MAGEE. I think it's really well-written, I think it's got great life lessons, I know most people love it, but I just didn't much care for it. I have never read it aloud in a classroom, nor have I handed it to a kid to read. I'm also not a big fantasy lover. I only read 1.5 of the HARRY POTTER books and have only seen a couple of the movies. It turns out that Jack has been hit in the eye by the shard of a mirror, broken by a goblin in a faraway world. Jack's heart is frozen and he becomes a very different person, eventually leaving all that he loves, including Hazel and his family, to follow the Snow Queen into the frozen woods. Hazel, being his best friend, decides she must go after him. On the way, she encounters any number of different friends and enemies, including some who appear to belong in one category, but then end up belonging in the other. Don Graves, my all-time favorite most important teacher ever, always said that poets and scientists have a lot in common, because both force us look at the world so closely, and through whole different eyes. I think of Don's comments often, and I was definitely thinking about them this week as I was reading Jane Yolen's book, BIRDS OF A FEATHER. 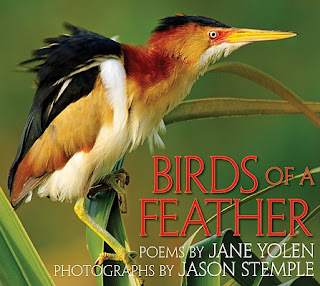 The book opens with a foreword by Dr. Donald Kroodsma, who says, "As an ornithologist obsessed with the details in the daily lives of birds, I know these eagles and chickadees and kingfishers…But after absorbing the poems and photographs here, I'll never see these birds again in the same way…"
Or how about Yolen's play on words in "Terns Galore"
In each poem, Yolen captures the spirit of that particular bird. I love this description of from"Rufous-Sided Towhee." 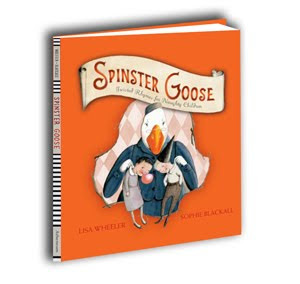 With a bit of orange…"
Each two-page spread also contains an inset box with interesting facts about that bird. Did you know, for instance, that "a black-capped chickadee is a hoarder that hides sides and other foods, each in a different place, and that days and weeks later the chickadee can remember all of these hiding places? Or that a "kingfisher kills or stuns a larger fish by thwacking it against a tree branch or perch?" And did I mention that each two-page spread has an absolutely magnificent closeup photograph of that bird. The light and shadows and details and lines had me looking and looking and looking again. I'd love to hang the photos on this book in my living room! Not sure if I'm just incredibly ignorant, but for as many times as I have been to California, I had never heard of the Watts Towers. Am I the only one? In case you are as clueless as I am, this National Landmark is a series of 17 sculptures, including 3 towers ranging from 55 to 95 feet tall. The sculptures were built by Italian immigrant, Simon Roddia, who spent thirty-four years bending and molding construction rebar, slathering it with mortar, and then embedding broken bits of glass, pottery, and other "junk" he found laying around his neighborhood. Roddia's story is told through the voice of Marguerite, a neighborhood child who was paid a penny per bag for helping Roddia gather the materials for his towers, then later grew up to introduce her children to her neighbor and his artwork. 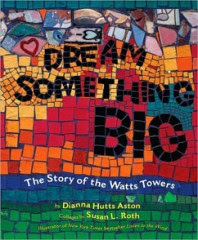 Two pages of author notes give factual information and photographs about the towers; then another two page spread invites children to create their own "Watts Tower" sculptures out of pipe cleaners, beads, buttons, foam shapes, and magazine clippings. Sounds like big fun to me! I found DREAM SOMETHING BIG at Tattered Cover. I have to admit, this book caught my eye because of the art. Susan L. Roth has illustrated more than 40 children's books, but is probably best known for LISTEN TO THE WIND. Roth works in collage (one of my favorite mediums) and her illustrations are absolutely gorgeous- intricate, colorful, eye catching, perfect for capturing the story of Roddia's sculptures. A few pages at the end of the book, as well the end pages, contain actual photographs of the Watts Towers. The earth is changing all the time. Some changes are slow, but some, like earthquakes are fast. An earthquake is a subject of the earth that happens under the earth's crust and under the ocean. Earthquakes mostly happened in California because thier was a big crack in thier. The thing that causes the earthquakes is the plates under the earth's surface. that can make a earthquake or a tsunami. People say the famous crack is on the Liberty Bell, but that wasen't an earthquake, the real famous crack was in Californa. How's that for scientific thinking?????? Anyone who knows me knows that I'm a sucker for a dog book. I have a couple I think kids are going to love in my CYBILS stack. And while I much prefer big dogs to little ones, the poem about Parson Russell Terriers (I'm thinking those might be about the same as Jack Russells) is probably my favorite in the entire book. The haiku are followed by two pages of doggy facts, some specific to the breeds, but more just general information. Did you know, for instance, that humans have 6 million olfactory receptors in their noses, but blood hounds have 230 million? Or that schnauzers are named for the German word for muzzle? 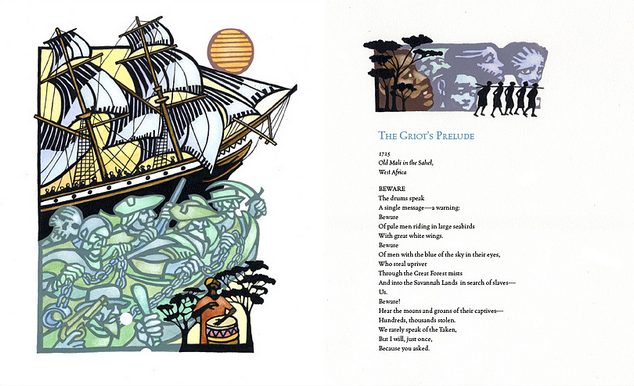 Rosen's haiku are illustrated by Mary Azarian’s gorgeously detailed woodcuts. 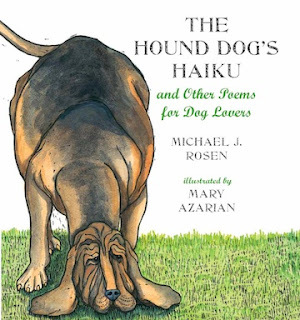 We are two weeks into a study of poetry right now, I'm thinking that my fourth graders are going to love comparing HOUND DOG HAIKU to Andrew Clement’s very different DOGKU. I read poetry to my fourth graders on an almost daily basis. So far this year, they have heard/read poets like Douglas Florian, J. Patrick Lewis, Anna Grossnickle Hines, Langston Hughes and Robert Frost. While they enjoy lots of different kinds of poetry, if I'm really honest, their favorite poems are the funny ones. I've just found a book, then, that I think my kids are going to love. but the problems would not cease…"
right down to their core. Each poem is adapted from or based on a well-known (ok, maybe some are not so well known, at least not to some kids) nursery rhyme. "The Gum Chewer," for example, comes from "See Saw Marjory Daw." "The Swearer," which I know my kids will love, is a take off on "Baa Baa Black Sheep:"
Here a BLEAT. There a BLEAT. There are poems about bullies, dirty kids, substandard subs, cheaters, nose pickers, interrupters, fibbers, and even one for the custodian. I know my kids are going to love every one! I checked this book out of the library, but it's definitely one I have to own! POETRY FRIDAY is hosted by April Halprin Wayland at Teaching Authors. I have been a CYBILS judge for the past four years. In 2008, I judged YA nonfiction, then moved to Elementary Nonfiction for 2009 and 2010. This year, I'm judging poetry, and to be really honest, I'm more than a little overwhelmed/intimidated. How in the world can I ever begin to capture the magnificence of books like Patricia McKissack's NEVER FORGOTTEN? "Even now I can hear music in his voice. Shum Da Da We Da Shum Da Da We Da." 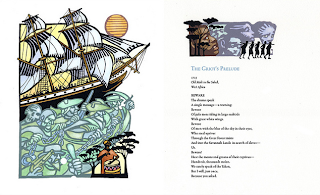 Then, as if all of this glorious language was not enough, the book is illustrated by Caldecott winners Leo and Diane Dillon. Their woodcut illustrations are absolutely gorgeous- incredible detail, rich color, varied page design- possibly even worthy of another Caldecott consideration? Mattie Breen is about to start fifth grade. In a new school. Mattie's mom lives by a motto, "When the going gets tough, the tough get going." And so Mattie and her mom have moved from place to place to place. 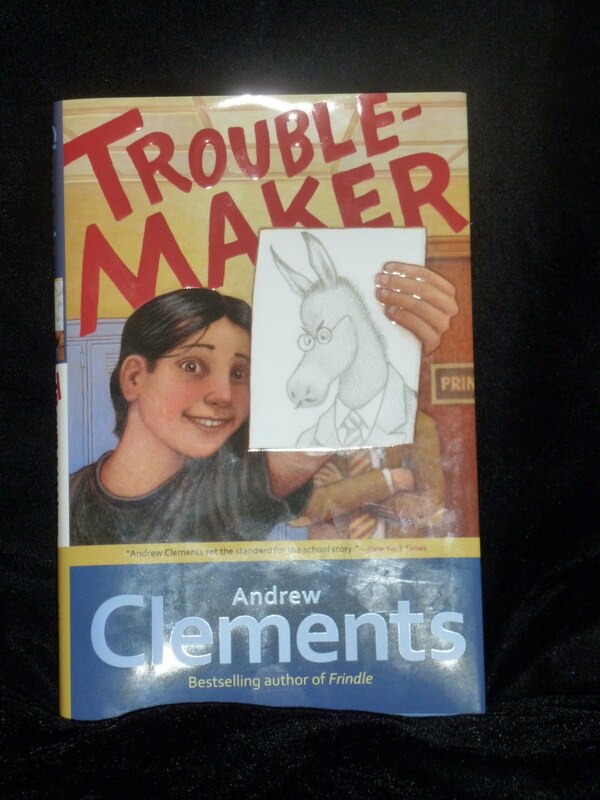 This time, they have ended up living with Mattie's Uncle Potluck, who is the custodian at the elementary school. Mattie is painfully, painfully shy. And terrified of starting at a new school. She has decided that she will deal with lunch and recess, problematic times during the day, by becoming a custodial apprentice to her uncle. In the weeks before school starts, she follows him around the elementary school, jotting down all of his "custodial wisdom" in a notebook. Mattie believes that becoming an indispensable custodial assistant will save her from having to interact with kids in her new school. I loved this book. Linda Urban did an amazing job of capturing the inner workings of a really, really shy child. How the meanness of one bully destroyed her. How afraid she was to even try to make friends. I loved the wisdom of Uncle Potluck. Loved how Mattie finally gathered up the bravery to make a friend. A terrific read. One upper intermediate teachers have to have for all of the Mattie's in their classes.